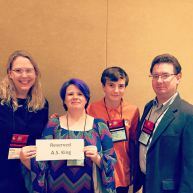 We are proud to be the home indie bookshop for award-winning YA author A.S. King. We offer signed and personalized copies of her books and ship anywhere in the US. Amy’s 2015 YA novel I Crawl Through It received an A rating from Entertainment Weekly and landed on all the cool end of year lists. Glory O’Brien’s History of the Future (2014) garnered seven starred trade reviews, was an Andre Norton finalist, and won the Amelia Elizabeth Walden Award. Reality Boy is a New York Times Editors’ Choice, Publishers Weekly, Kirkus and School Library Journal Best Book. Ask the Passengers is a Los Angeles Times Book Prize Winner, a Kirkus Reviews, Publishers Weekly & School Library Journal Best Book and has been called “another thoughtful, and often breathtaking achievement” by Booklist in one of six starred trade reviews for the book. Everybody Sees the Ants is an Andre Norton Award finalist, a Cybils finalist, and a YALSA Top Ten book for young adults. Her novel Please Ignore Vera Dietz is a Michael L. Printz Honor Book, and an Edgar Award Nominee. Her first novel, The Dust of 100 Dogs, is an ALA Best Book for Young Adults, an Indie Next pick and a Cybil award finalist. Her short fiction for adults has been widely published and was nominated for Best New American Voices 2010. Amy now lives in the Lititz area with her family and and their new kitten Ziggy Jack..